© 2002, © 2018 by Paul Freeman. Revised 3/22/18. A 1916 photo of biplanes & a large number of spectators in front of the hangar of the Curtiss Aviation School. During its half dozen years of operation, the Curtiss Flying School trained a large number of civilian flyers, both American & Canadian. The first group of U.S. National Guardsmen to take to the air received training at Newport News before going on to active duty in the U.S. Army Air Corps. Many Canadians who served in the war also won their wings at the little field overlooking Hampton roads. 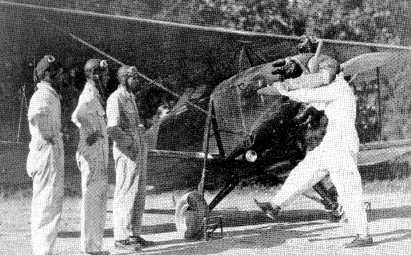 Victor Carlstrom, an instructor at Curtiss, set world's records for speed & distance in the flight of a modified Jenny from Curtiss Field to New York. Ballroom dancer Vernon Castle left his willowy wife & partner, Irene, to train in Newport News for overseas flight duty. Another student was Geoffrey O'Hara, composer of 'K-K-K-Katie'. Such other pioneer pilots as Eddie Rickenbacker & Eddie Stinson were associated with the school. A map showing the location of the Curtiss Flying School flying field & hangar. 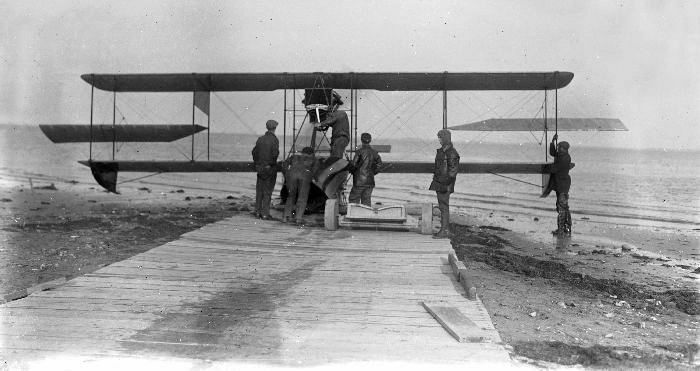 A 1916 photo of a Curtiss Model F seaplane being moved into the water from the Curtiss Aviation School ramp. Newport News native Cary Epes died in a training plane crash in 1917 at the Curtiss Flying School. Bruce Terrell observed, “General Billy Mitchell learned to fly there. took off & landed right above the wrecks of the ships that were sunk by the CSS Virginia during the Civil War. The USS Monitor & the Virginia fought their famous battle right off of this point of the peninsula. An undated photo of the hangar of the Curtiss Aviation School. An undated photo of an unidentified biplane in front of the Curtiss Aviation School hangar. 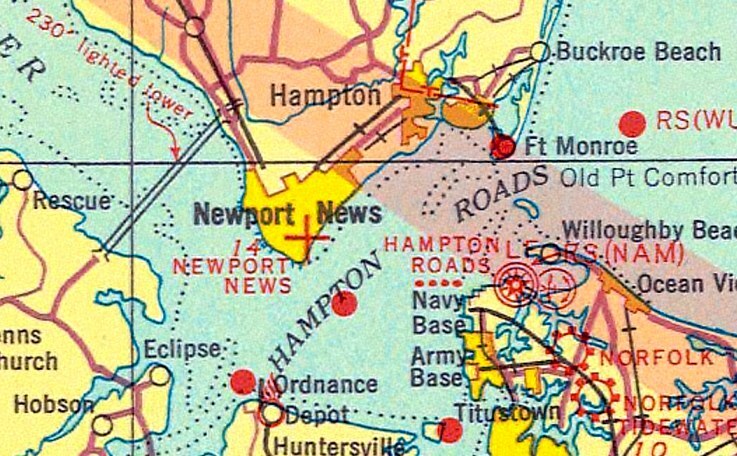 as the 1935 Norfolk Sectional Chart (courtesy of Roger Connor) depicted “Newport News” as an auxiliary airfield. nor did the 1951 USGS topo map. A 1963 aerial photo showed the hangar was gone, and several buildings had been constructed over the northwest portion of the flying field. 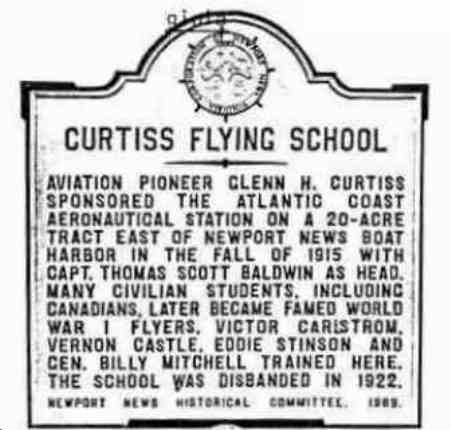 An undated photo of Newport News aluminum historical city marker #12, commemorating the Curtiss Flying School. Located at the foot of Jefferson Avenue facing Hampton Roads, unveiled 11/7/69. 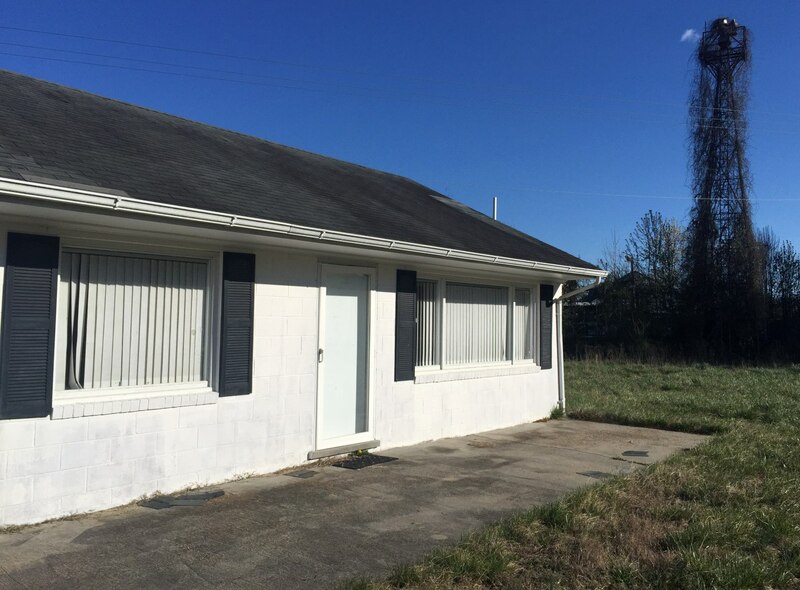 Purchased by Newport News Historical Committee. nephews & grandnephews of Newport News native Cary B. Epes, who died in a training plane crash in 1917 at the Curtiss Flying School. 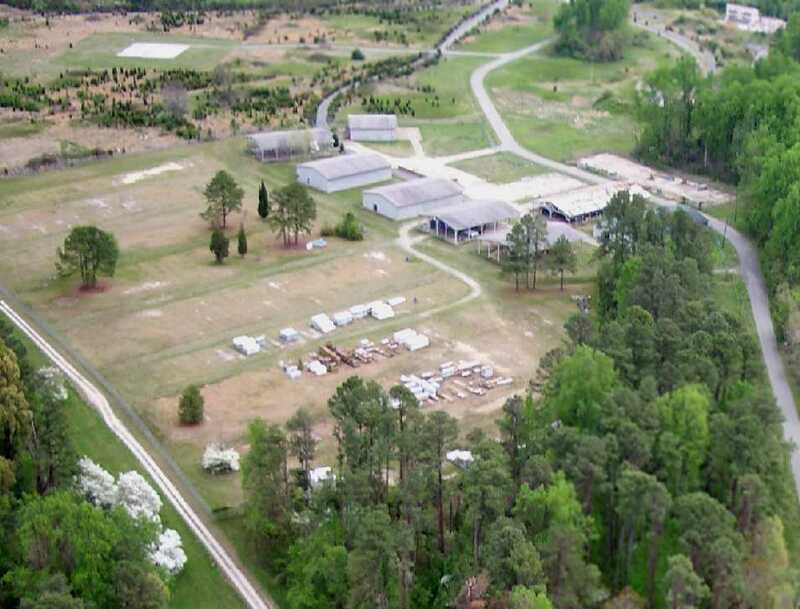 A 4/16/10 aerial photo showed no trace remaining of the Curtiss Aviation School. As of 2013, road maps label the central portion of the airfield as King-Lincoln Park. The site of the Curtiss Aviation School is located at the southern terminus of Jefferson Avenue. 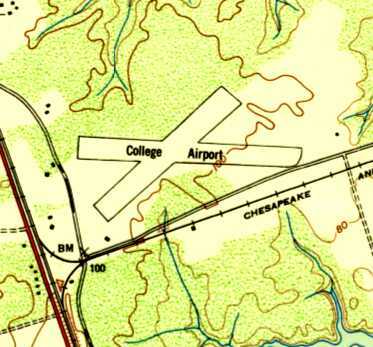 Heathsville Airport, as depicted on the 1968 USGS topo map. Photo of the airport while in operation is not available. 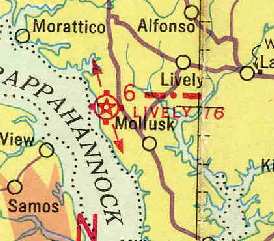 Heathsville Airport was not yet depicted on the 1962 USGS topo map. Sharon Clark recalled, “My dad operated a public state airstrip on our farm near Heathsville. 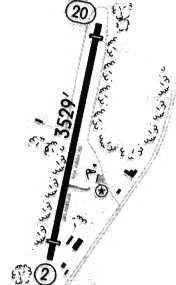 The earliest depiction of Heathsville Airport which has been located was on the 1968 USGS topo map. It depicted the field as having a single unpaved northeast/southwest runway, labeled simply as “Landing Strip”. According to the VAHS book "Virginia Airports" by Vera Rollo & Norman Crabill. 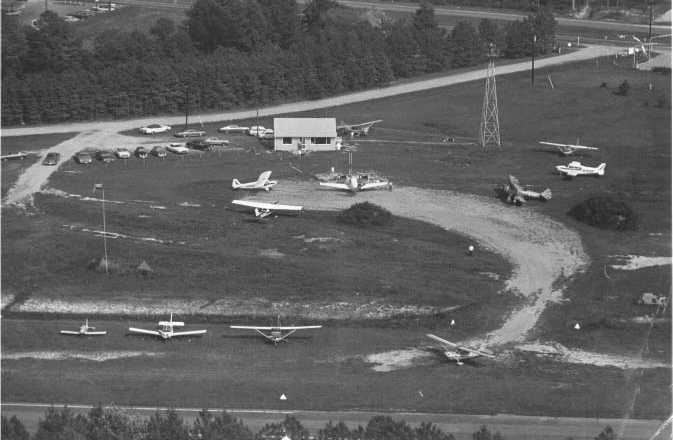 The only photo which has been located showing Heathsville Airport while in operation was a 1968 aerial view. It depicted the field as having a single unpaved northeast/southwest runway, with one single-engine plane parked on the northeast side. though power lines on Coan Wharf Road (marked with orange balls) limited the usable on Runway 3 somewhat. but it was level & no problem when using the runway. The grass was meticulously maintained; it was the smoothest turf runway I've ever landed upon - it felt like a carpet under the wheels. Mr. Clark kept a Mooney there for a number of years, and there were several tiedowns available for rent. 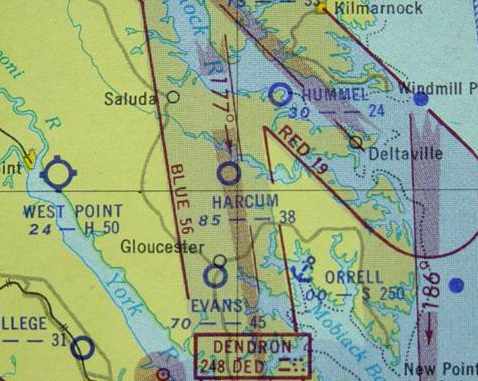 The earliest aeronautical chart depiction which has been located of Heathsville Airport was on the 1971 Washington Sectional Chart. 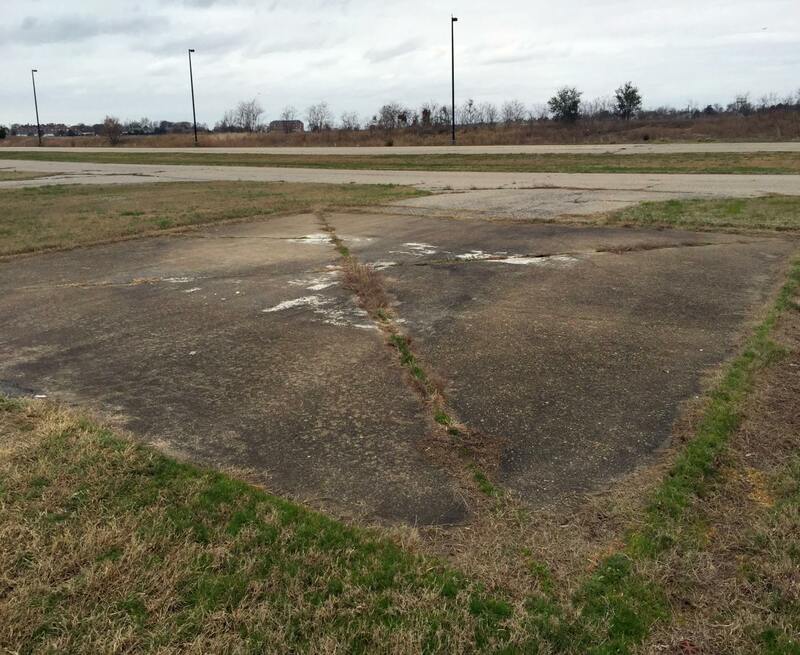 It depicted Heathsville as a public-use airport having a 3,100' unpaved runway. depicted Heathsville as a full-service public-use airport, with a Unicom, and lighting upon request. and indicated that the field had ultralight activity. having a 2,400' unpaved runway, with lighting upon request. Bob Newman recalled, “My last flight into Heathsville was 4/15/91-4/16/91. Mr. Clark eventually sold the property to the farmer that lived across Coan Wharf Road from him. the white runway marking cones were removed, the runway was plowed, and it became part of the soybean field. 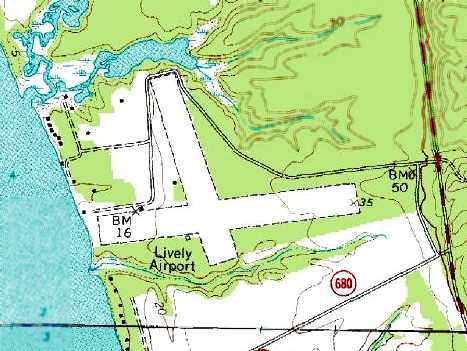 Heathsville Airport was still depicted on the 1993 USGS topo map. 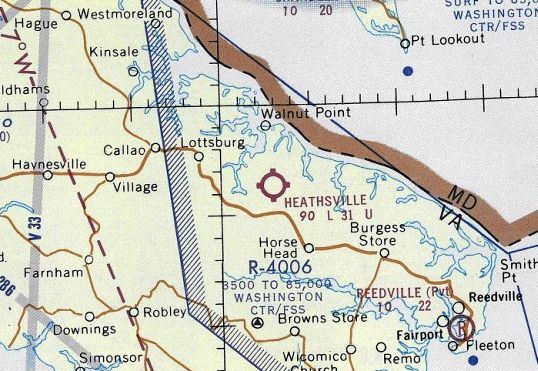 The last aeronautical chart depiction which has been located of Heathsville Airport was on the March 1994 Washington Sectional Chart (courtesy of Ron Plante). Heathsville's status had changed to a private airfield at some point between 1990-94. 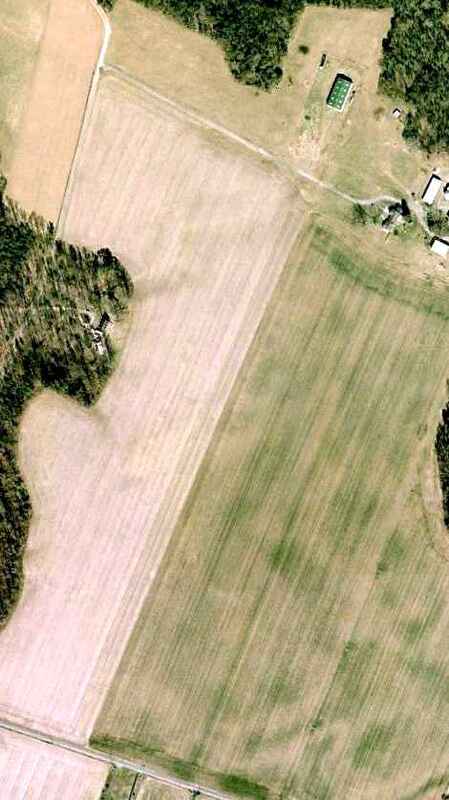 The 1994 USGS aerial photo did not show any aircraft on the field, which otherwise remained unchanged. 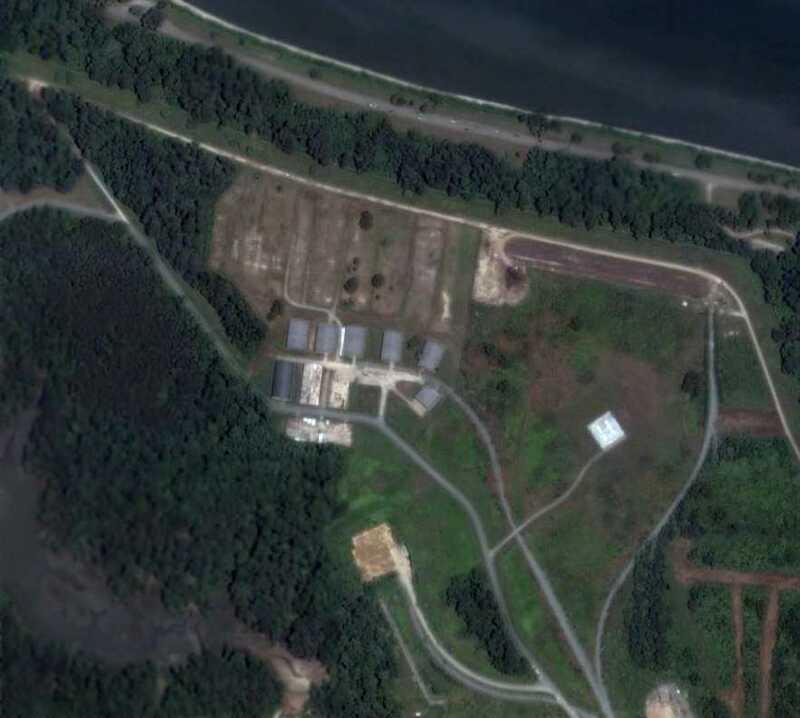 as a 2005 aerial photo showed that a building had been built over the northern portion of the runway. but Bob Newman observed that as of 2013 “It's interesting to note that Heathsville Airport is still marked on Google Maps. but there was no recognizable trace of an airport. 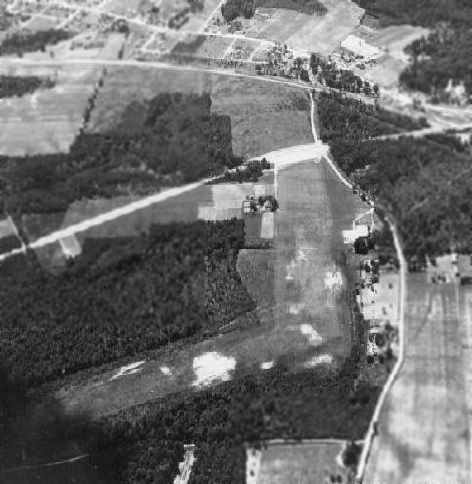 The site of Heathsville Airport is located northeast of the intersection of Routes 629 & 634.
showing the facility in its original configuration with 28 Model II Launcher Shelters for the BOMARC A missile. The purpose of this military base was to shoot down incoming aircraft. It is included here due to its significance in Cold War history. 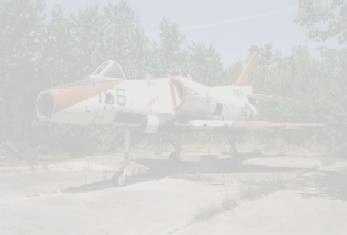 This site was one of a network of 8 BOMARC sites spread around the nation. Niagara Falls, NY, Kinchloe AFB, MI (Raco AAF), and Duluth IAP, MN. the installation was 6 miles west of the Air Force Base. The BOMARC missile was huge: each one stood 45 feet tall & weighed 16,000 pounds. a range of 440 miles, along with a maximum speed of nearly Mach 4. The Langley BOMARC site was manned by the 22nd Air Defense Missile Squadron. was a diagram of its Missile Support Area & Launch Area from the 12/3/59 Boeing “IM-99A Bases Manual”. It depicted the facility in its original configuration with 28 individual BOMARC A “Model II Launcher Shelters”. The Ground-to-Air Transmitter site (which provided missile guidance) was depicted 4.25 miles to the northwest. 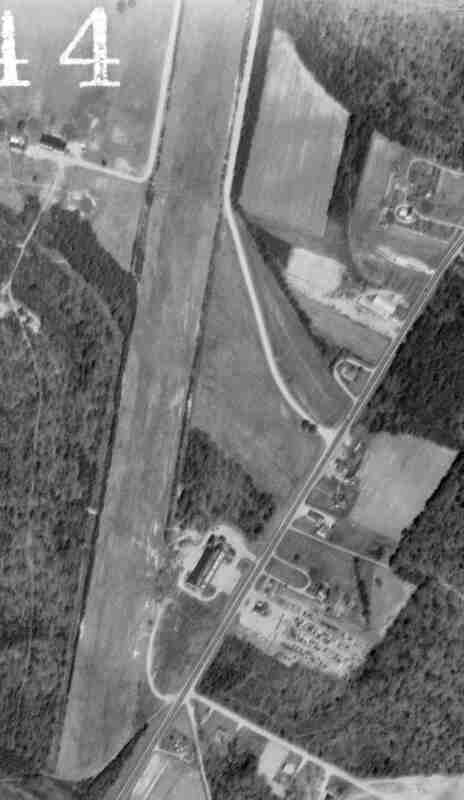 The earliest photo that has been located of the Langley BOMARC site was a 1963 aerial view. in addition to its original complement of 28 BOMARC A launcher shelters (on the west side). 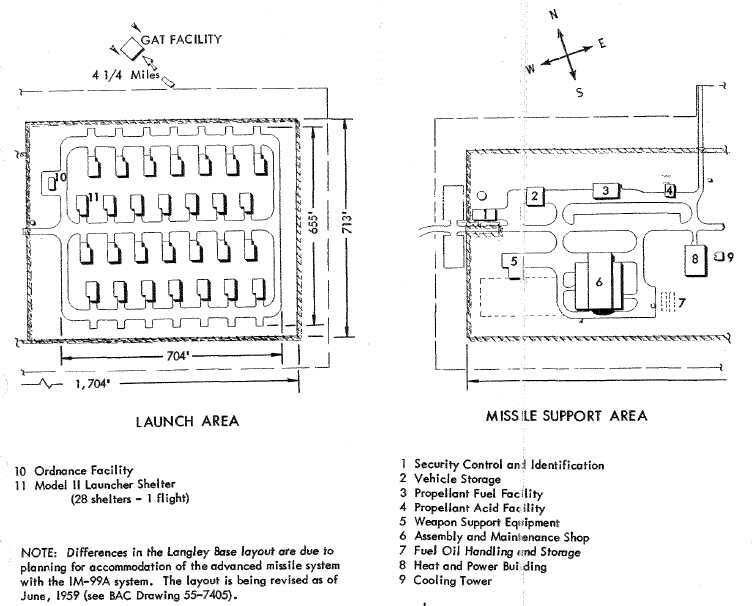 The 1965 USGS topo map depicted the Langley BOMARC site, but did not depict the individual missile shelters. The earliest photo that is available of the Langley BOMARC site was a 1965 USAF Public Affairs aerial view (courtesy of John Eckert) looking northwest. and the the original complement of 28 BOMARC A launcher shelters were in the background. As John observed, “This was a combined BOMARC A & BOMARC B site. 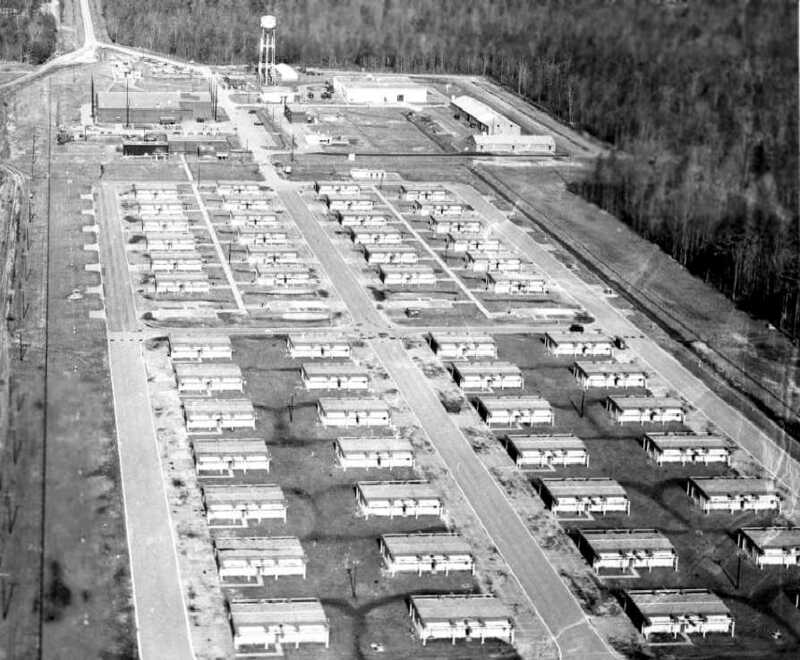 A 1965 USAF Public Affairs aerial view (courtesy of John Eckert) looking northeast at the Langley BOMARC site. 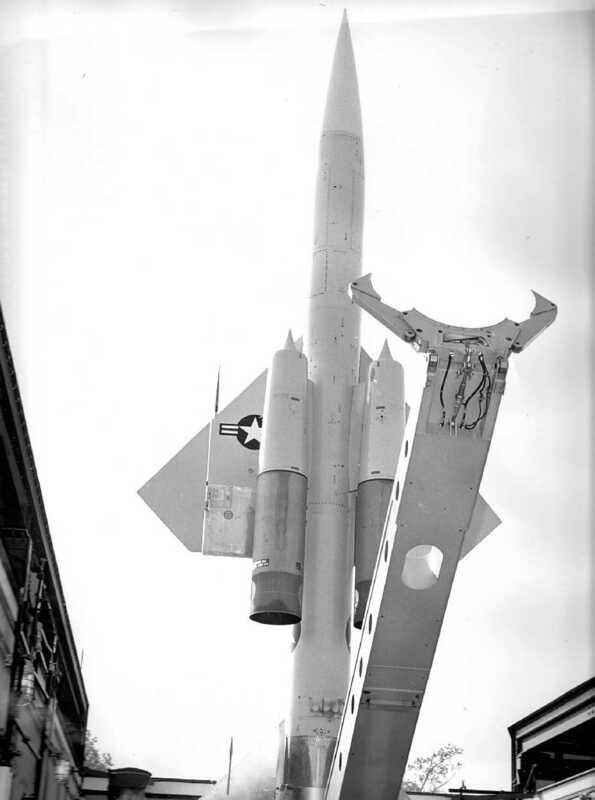 A 1965 USAF Public Affairs photo (courtesy of John Eckert) of a BOMARC missile elevated in its Langley shelter. The 56 BOMARC missile shelters were still depicted on the 1986 USGS topo map at the Langley BOMARC site. A 1992 photo by Mark Morgan of the Langley BOMARC missile shelters. Mark reported, “An intact BOMARC site is what we find. All of the buildings & all of the missile shelters are in place, with the former serving as the Service Center of Operations & Transportation, Newport News Public Schools. The 22nd had 56 A & B missiles & some of the shelters are open. The launchers now belong to the Newport News Fire Department & are used for storage & training. I went into a couple of shelters (after getting permission) & now know what the inside looks like. The shelters are Type IIs; they have a 10' deep well at the back for clearance & blast deflection. Most of the piping is in place. 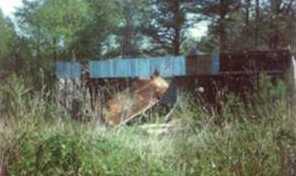 Alongside the shelters was a continuous corrugated metal duct of some sort, measuring about 3' high by 5' wide. with only a cleared patch of land remaining. and it appeared as if the installation had been reused as a school bus storage/maintenance facility. 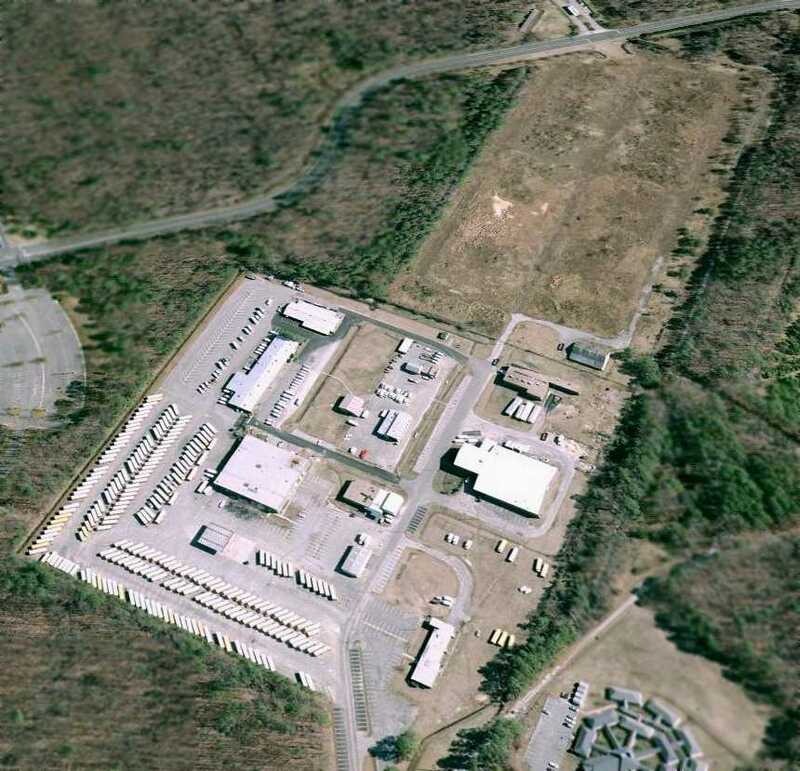 shows many of the former missile site buildings, including the large assembly & maintenance shop at the lower-right. However, the cleared patch of land in the background was the site of the former missile launcher buildings. 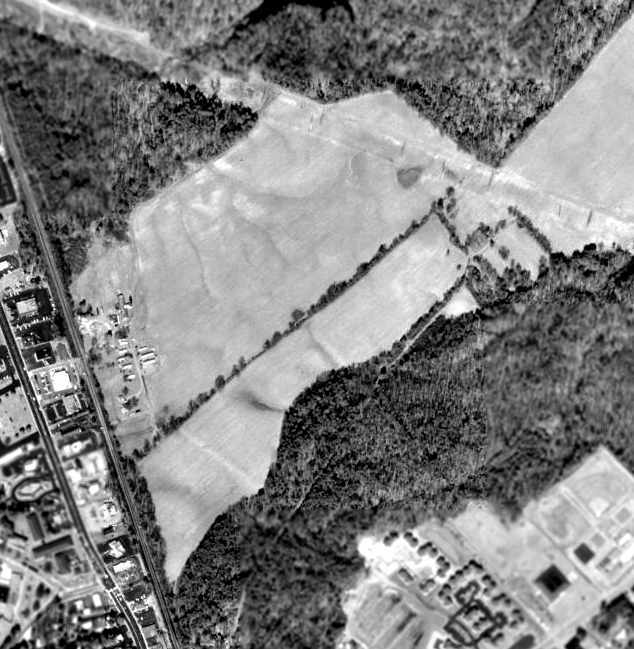 The Langley BOMARC site is located east of the intersection of Hogan Drive & Rattley Road. 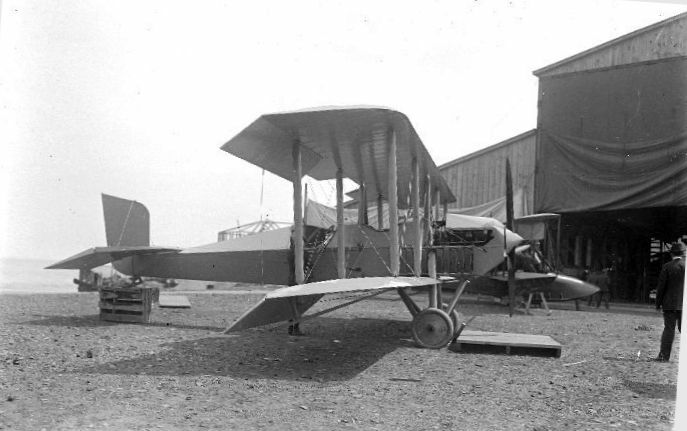 A 1919 photo of a Curtiss JN-4 Jenny biplane at the Yorktown Naval Aviation Field. at what was then known as the U.S. Mine Depot. The school provided the 1st advanced aviation training for pilots in bombing, torpedo, and gunnery operations. 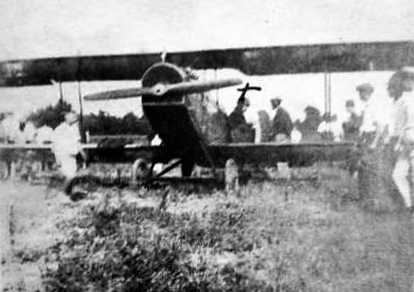 was a 1919 photo of a Curtiss JN-4 Jenny biplane at the field. A 6/23/21 photo looking southwest at 2 unidentified biplanes in front of 4 hangars at the Yorktown Naval Aviation Field. showing a total of 8 biplanes (Martin MT/MBTs & DH-4s), 2 airplane hangars, and 2 much larger blimp hangars. The airfield area was a large open grass area in between the hangars & the river. The photo was taken when Yorktown was being used to support Billy Mitchell's trial bombing of battleships off the Virginia Capes. 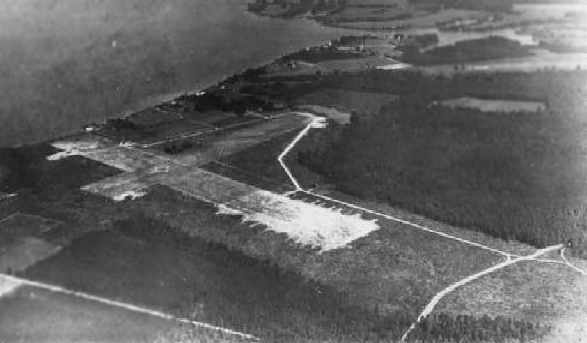 The Yorktown airfield was said to be L-shaped, with each end being 3,000' long. The Navy aviation training school at Yorktown ceased operations in August 1921, according to a historical marker. which was anchored in the York River adjacent to the airfield. 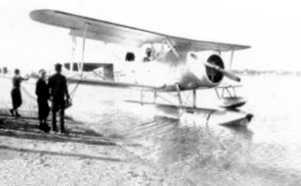 (a Sikorsky S-29A twin-engine biplane) landed at the Yorktown Naval Aviation Field after its flight from New York City. The last photo which has been located showing an aircraft at Yorktown was a 1939 photo of an unidentified Navy biplane floatplane. All aviation at Yorktown ceased prior to WW2. 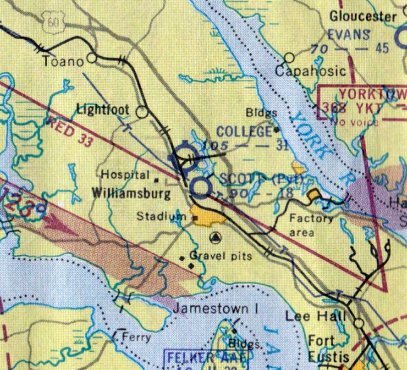 Nothing of the Yorktown airfield was depicted on the 1952 USGS topo map. Naval Mine Depot Yorktown became Naval Weapons Station Yorktown in 1958, when the Navy expanded the mission of the base. and several buildings had been constructed over the site of the former hangars. 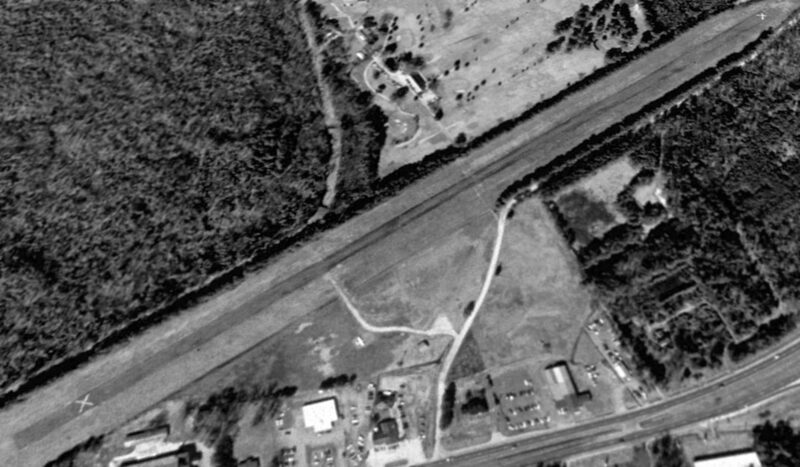 The 1994 USGS aerial photo showed that a helipad had been built on the east side of the former Yorktown airfield at some point between 1963-94. An undated (circa 1990s?) 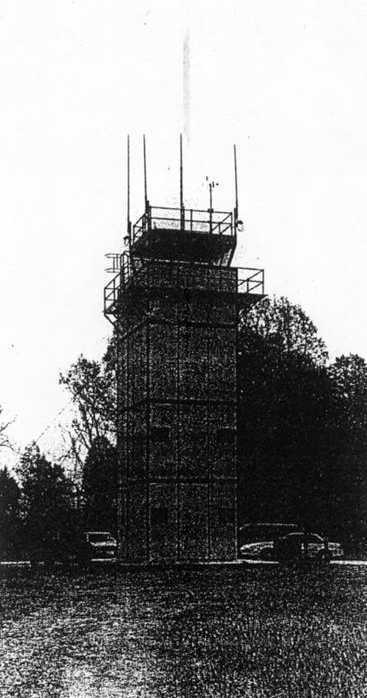 photo of Yorktown's heliport control tower. taken from a radio-controlled model aircraft. Note the alignment of the road on the right side is unchanged from that seen in the 1921 aerial photo. and what appear to be the foundations of the 1919-era hangars are on the right. dedicated a historical marker commemorating Aviation Field Yorktown. and what appear to be the foundations of the 1919-era hangars in the center. which consists of a 100'-square concrete lighted pad. 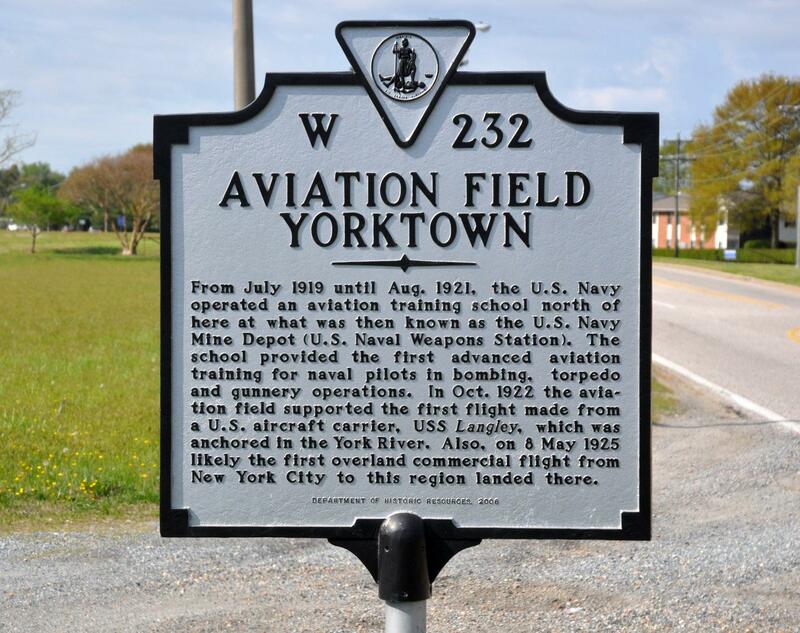 A 4/25/14 photo by Richard Flagg of the 2006 historical marker commemorating Aviation Field Yorktown. The site of the Yorktown Naval Aviation Field is located northwest of the intersection of Main Road & Diggs Road. 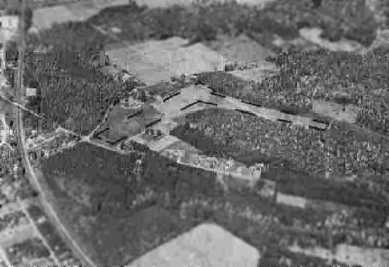 A 1939 aerial view of Harcum Airport. a license was granted to M.S. & W.M. Harcum on 8/21/39 for Harcum Airport. which showed the airfield to consist of a single unpaved north/south runway. was on the August 1940 Norfolk Sectional Chart (according to Chris Kennedy). described Harcum Airport as having a 2,000' unpaved runway. However Harcum Airport was not depicted on the September 1944 Norfolk Sectional Chart (courtesy of Ron Plante). depicted Harcum Airport as an auxiliary airfield. 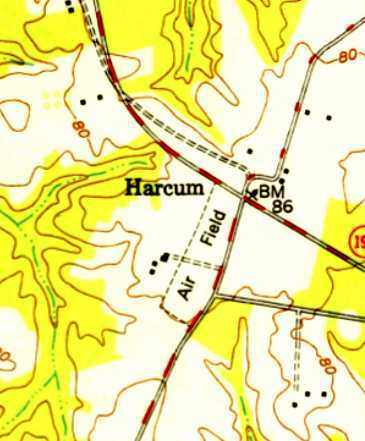 Harcum Airport, as depicted on the 1946 USGS topo map. was a 1947 photo by Ray Tyson of a PT-19, with the store with the windsock in the background. A circa 1947 photo of a PT-19 & another taildragger at Harcum Airport. 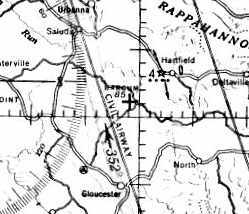 The 1949 USGS topo map depicted Harcum as a northeast/southwest outline, labeled simply as “Air Field”. depicted Harcum as having a 3,800' unpaved runway. and listed as an active airfield in the 1957 Aviation Week Airport Directory (according to Chris Kennedy). this turf field was said to be 3,850' long. because the field had been abandoned & the property was sold by M.S. Harcum. 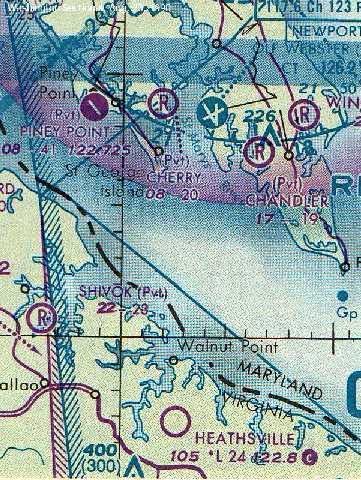 was on the May 1960 Chesapeake Bay World Aeronautical Chart (courtesy of Scott Kimball). It depicted Harcum as having a 3,800' unpaved runway. and no aviation activity was evident in a 1963 aerial photo. 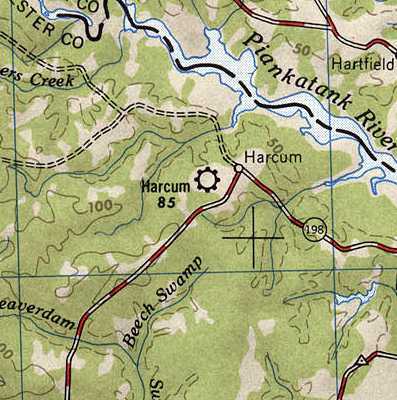 The Harcum Airport was no longer depicted on the 1969 or 1972 USGS topo maps. 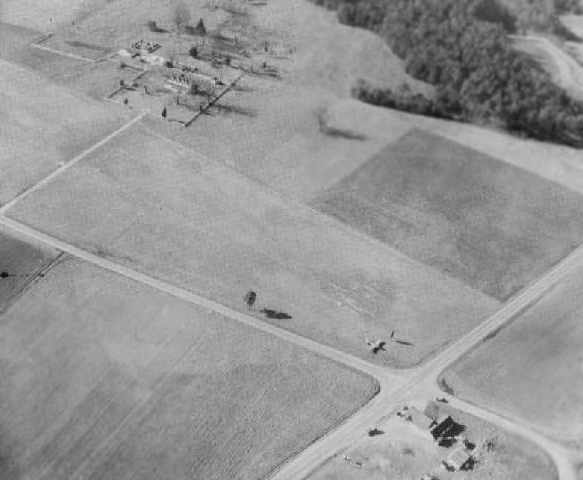 A 1979 aerial view looking southwest at Harcum Airport showed a single light aircraft just above the road intersection. on the 1982 or 1986 USGS topo maps. 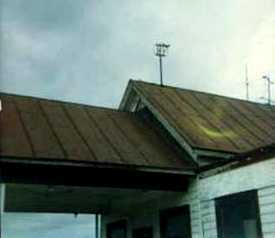 a 1984 photo of the windsock frame which remains on the roof of the old store. In the 1994 USGS aerial photo, it can be seen that the majority of the former runway at Harcum has remained clear. There do not appear to be any buildings remaining that were directly related to the airfield. A May 2004 photo by Russ Roslewski, looking northeast at the field which is the site of Harcum Airport. 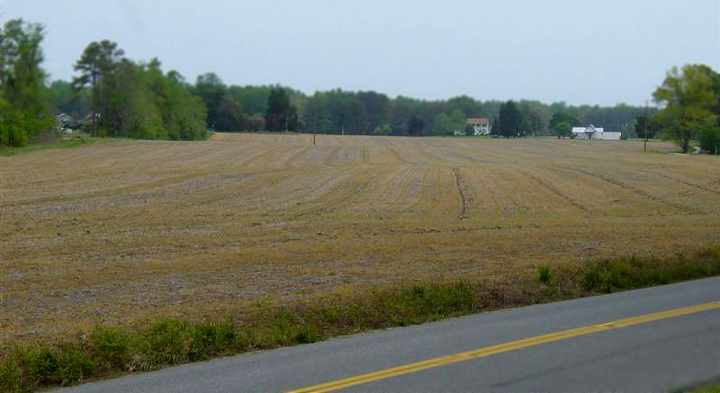 Russ reported that the property “is now used as farmland. The site of Harcum Airport is located southwest of the intersection of Glenns Road & Indian Road. 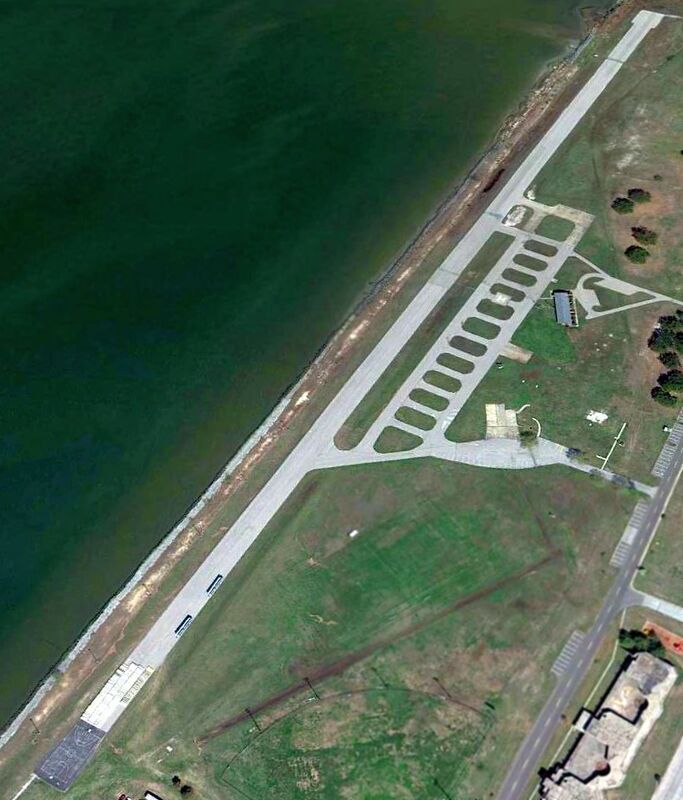 Thanks to Russ Roslewski for pointing out this airfield. A 1932 photo of William & Mary Flight Club president Travers Hulse hand-propping a Viking B-8 Kitty Hawk (registration # NC975M) at Scott Field. 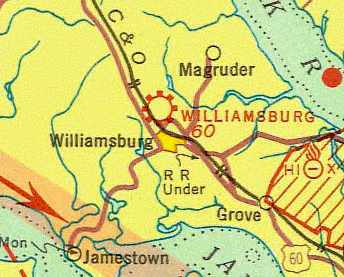 This early airport for the town of Williamsburg was located adjacent to the north side of the town. to offer flying lessons in its regular course catalog. They conducted flight lessons for a short time out of Riordan Field, a field located on the Harwood Farm. and Scott Field was christened in 1931 after the owner of the land. and the school purchased planes to operate its flight school. The flight school was heavily publicized by several college publications. was a 1932 photo of William & Mary Flight Club president Travers Hulse hand-propping a Viking K-8 Kitty Hawk. A 1932 photo of the same Viking K-8 Kitty Hawk at Scott Field (courtesy of Bob Coolbaugh). forest green with gold trim & a gold university shield on the fuselage aft of the cockpit. Marcus Zechini reported in 2015 that this Kitty Hawk is being restored, and is one of only 3 still in existence. in front of the William & Mary Flight School operation at Williamsburg’s first airport, Scott Field. An undated photo which appears to be from the same photo shoot, of 2 unidentified biplanes in front of the William & Mary Flight School hangar at Scott Field. A undated (circa 1930s?) photo of the Marine Corps' sole example of the Curtiss RC-1 Kingbird at Scott Field. 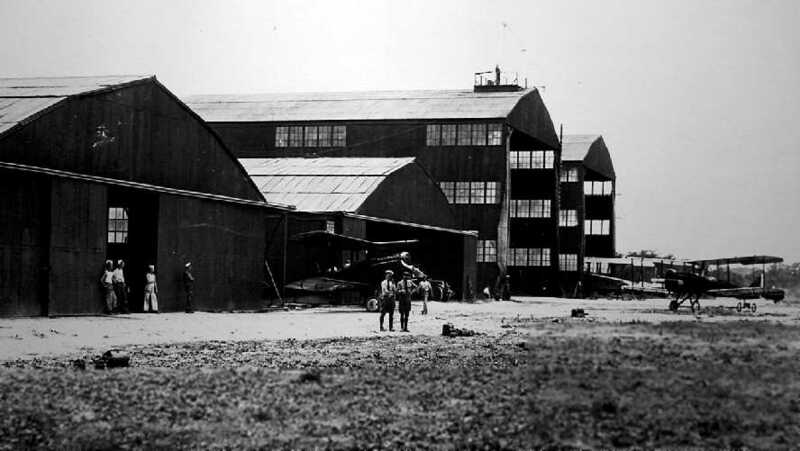 A 1933 photo of Scott Field's hangar. as the school was in debt & student enrollments were dropping. The department's aircraft were sold. with the last reference to its operation being found in a 1935 William & Mary yearbook. The earliest aeronautical chart depiction of the field which has been located was on the 1935 Aero Chart. It depicted the “Williamsburg” airport adjacent to the north side of the town as a commercial/municipal airport. depicted the airport as having 2 grass runways oriented in an “L” shape. An undated photo in the book "Virginia Airports"
depicted a Civil Air Patrol Piper J-4 Cub landing at Scott Field. with two 1,800' runways, oriented north/south & east/west. which was said to offer facilities for servicing aircraft, day only. 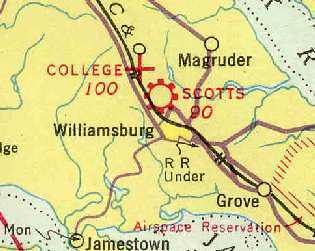 depicted “Scotts” as a commercial/municipal airport. as a 300 acre L-shaped property within which were 2 sod runways, measuring 2,000' northeast/southwest & 1,850' WNW/ESE. The field was said to have 2 hangars: 60' x 45' brick & steel, and 45' x 30' wood & metal structures. The field was described as being privately owned & operated. 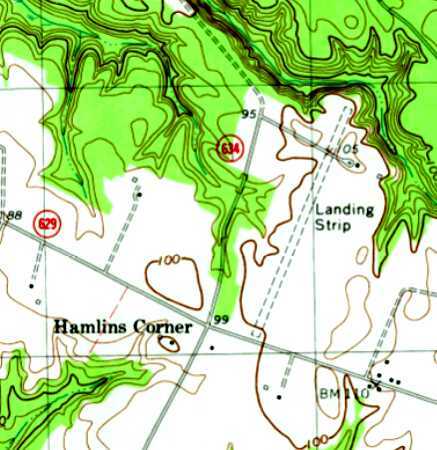 Scott Field was not depicted at all on the 1951 USGS topo map. 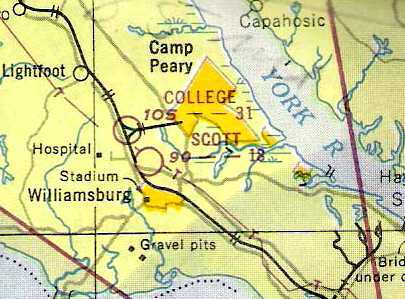 The January 1952 Sectional Chart depicted Scott as a public-use airfield having a 1,800' unpaved runway. 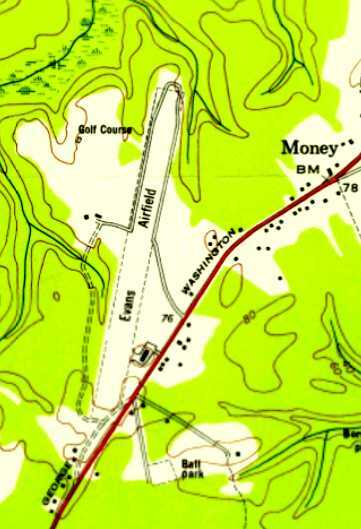 Scott Field was still depicted on the 1955 USGS topo map. 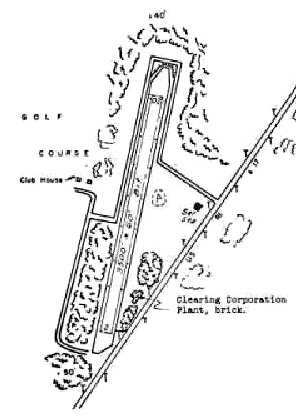 Scott Field may have briefly been reopened as a private airfield, as that is how it was depicted on the 1957 Norfolk Sectional Chart. It depicted Scott as having an 1,800' unpaved runway. A 1963 aerial photo showed the open grass area of Scott Field remained clear & unredeveloped. 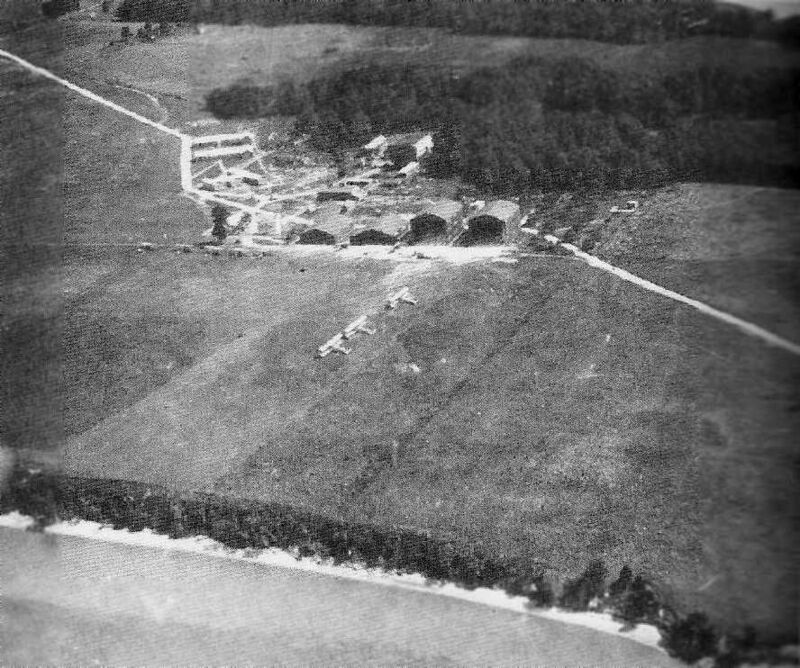 A cluster of small buildings was located on the western edge, but it was not apparent if they were airfield-related. Scott Field was no longer depicted at all on the 1965 Norfolk Sectional Chart (courtesy of John Voss). 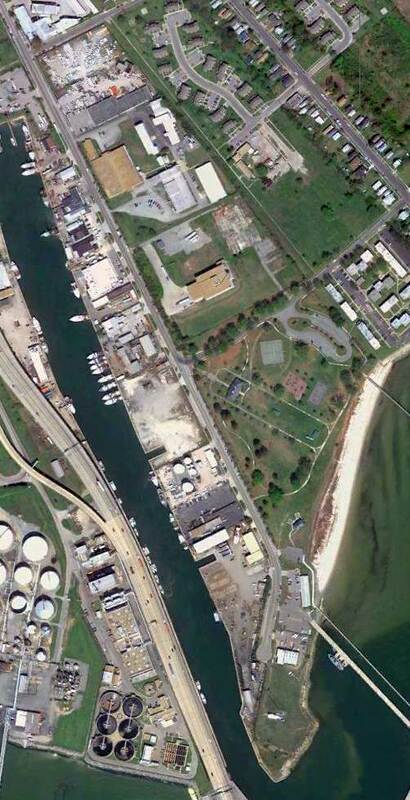 In the 1994 USGS aerial photo, it can be seen that the site of Scott Field has remained clear & unredeveloped. It is not known if any of the buildings on the western edge of the clearing date from the site's days as an airfield. The site of Scott Field is located east of the intersection of Route 603 & Pierpoint Place. 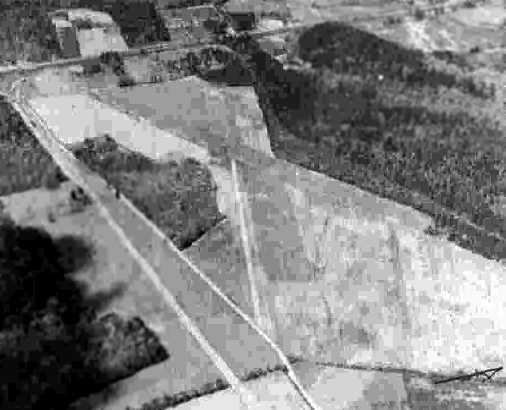 A 1936 aerial view looking east at College Airport depicted it as having 2 grass runways in an “X” shape. 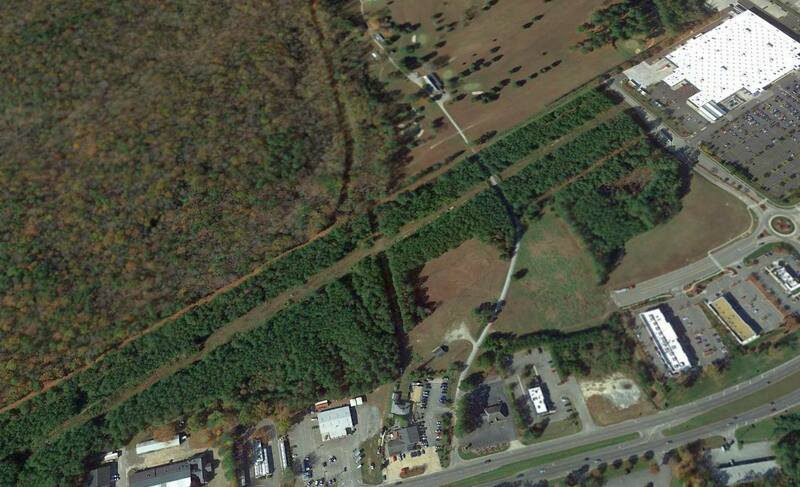 This former small airport was originally associated with the nearby College of William & Mary. the operating license for College Airport was applied for in 11/10/31 & was granted in 12/7/31. The 1935 Aeronautical Chart did not depict College Airport at all. 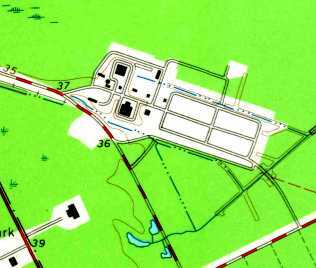 with 2 runways: 2,250 northeast/southwest & 2,100' northwest/southeast. 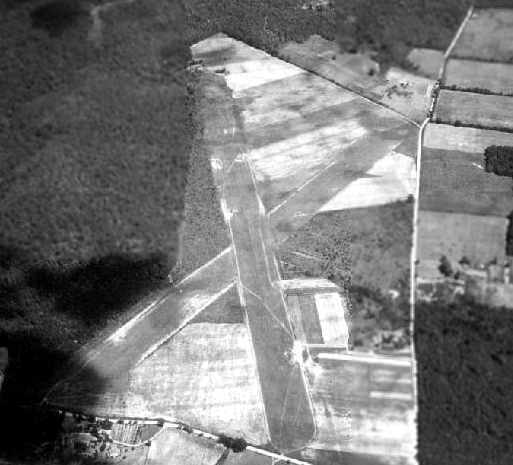 was an August 1936 aerial photo in the book "Virginia Airports". 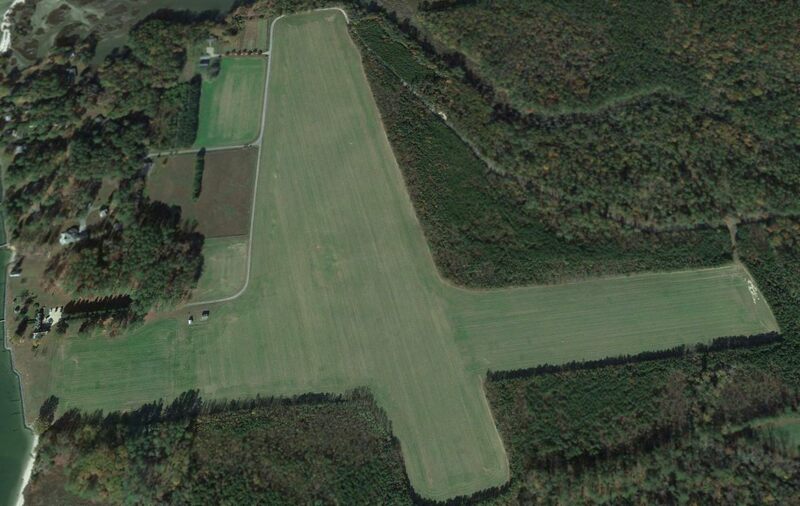 It depicted the "Old Williamsburg Airport (College of William & Mary)"
as having 2 grass runways in the shape of an "X". was on the July 1941 Norfolk Sectional Chart (courtesy of Chris Kennedy). It depicted "College" as an auxiliary airfield. and indicated that Army flying operations were also conducted from the field. (according to the book "Virginia Airports"). It was depicted as "William & Mary" on the April 1945 Norfolk Sectional Chart (courtesy of Chris Kennedy). within which were 2 sod runways, measuring 2,900' east/west & 2,530' northeast/southwest. to be privately owned, and operated by the VA State Guard. 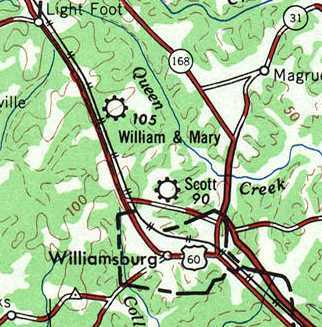 It was depicted as "William & Mary" on the 1946 USGS topo map. An undated photo of 5 Pipers at College Airport. as that is how it was depicted on the 1951 USGS topo map. It depicted College as having 2 runways & one small building on the southwest side. The January 1952 Sectional Chart depicted College Airport as having a 3,100' unpaved runway. 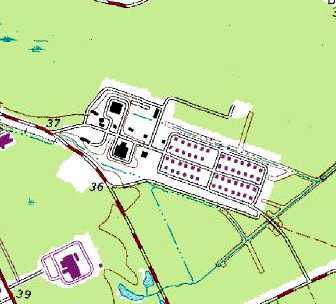 depicted College Airport as having a 3,100' unpaved runway. The 1957 Norfolk Sectional Chart depicted College Airport as having a 3,100' unpaved runway. 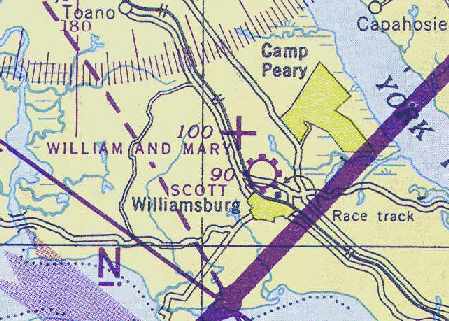 It was still depicted as “William & Mary” Airport on the 1955 USGS topo map. as that is how it was depicted on the May 1960 Chesapeake Bay World Aeronautical Chart (courtesy of Scott Kimball). It depicted Central as having a 4,200' unpaved runway. 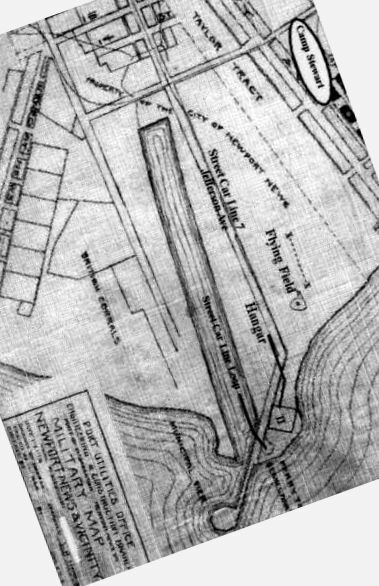 who had left his Central Airport in Richmond to operate the field in Williamsburg. Central Airport was depicted on the 1961 Norfolk Sectional Chart (according to Chris Kennedy). Central Airport was described to be flourishing for a while in the 1960s. Central Airport was described in the 1962 AOPA Airport Directory as having 2 turf runways: 4,200' Runway 6/24 & 3,100' Runway 9/27. The operators were listed as Ruby & Guy Clark. 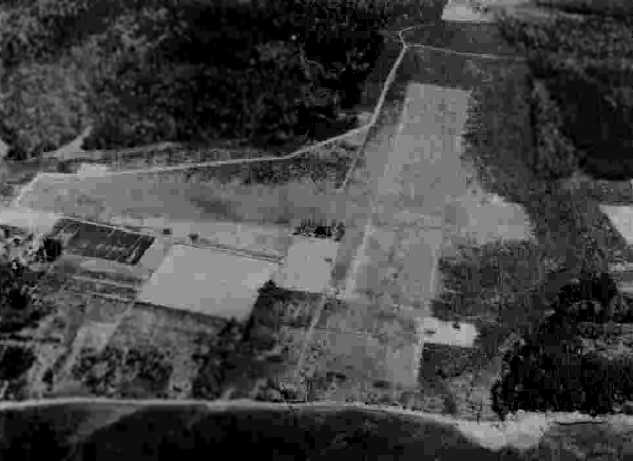 The last photo which has been located showing Central Airport in operation was a 1963 aerial view. It depicted the field as having 2 grass runways, and a total of 11 light aircraft parked around several T-hangars on the southwest side of the field. Randy Jones recalled, “I was stationed a Ft. Eustis in early 1965 & was an 18 year old private pilot. On my first visit to Central Airport I rented a Tri-Champ (N9591B) from Mr. Clark & later flew his 90hp Champ (N4486E) & his 95hp Champ (N4446E). was on the 1965 Norfolk Sectional Chart (courtesy of John Voss). 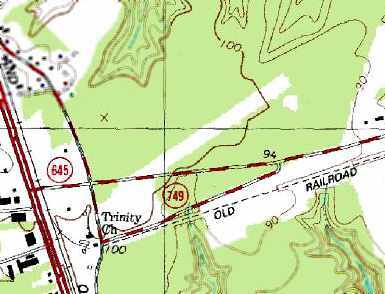 The Aerodromes table on the chart described it as having 2 turf runways, with the longest being 4,200'. I took my first flying lesson from Floyd Clark on 7/26/66 in an Aeronca 7EC (N4683E). gas pump, and perhaps 10 aircraft based at the field. the above mentioned Aeronca 7EC, a Champion 7FC (N7519B), and a Cessna 170. I believe he also owned a second Aeronca 7EC which he was refurbishing. Floyd Clark last signed my logbook on February 5, 1967. About a week later he died of a massive coronary while visiting his son in Florida. According to Chad Pritchard (who had an uncle who owned an airplane that was based there), Central Airport closed in 1967. Tom recalled, “I landed at the Central Airport on 6/26/67. but after landing it became obvious that it had either been officially closed or abandoned by this date. on the 1970 Washington Sectional Chart (courtesy of John Clifford). A 1987 photo of a collapsed T-hangar at the site of Central Airport. A 1987 photo of the abandoned main hangar at the site of Central Airport. 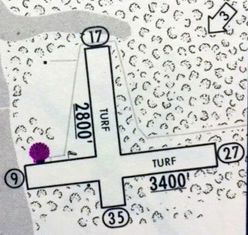 The 1989 USGS topo map still depicted the clearing for one runway (northeast/southwest) of the former Central Airport. 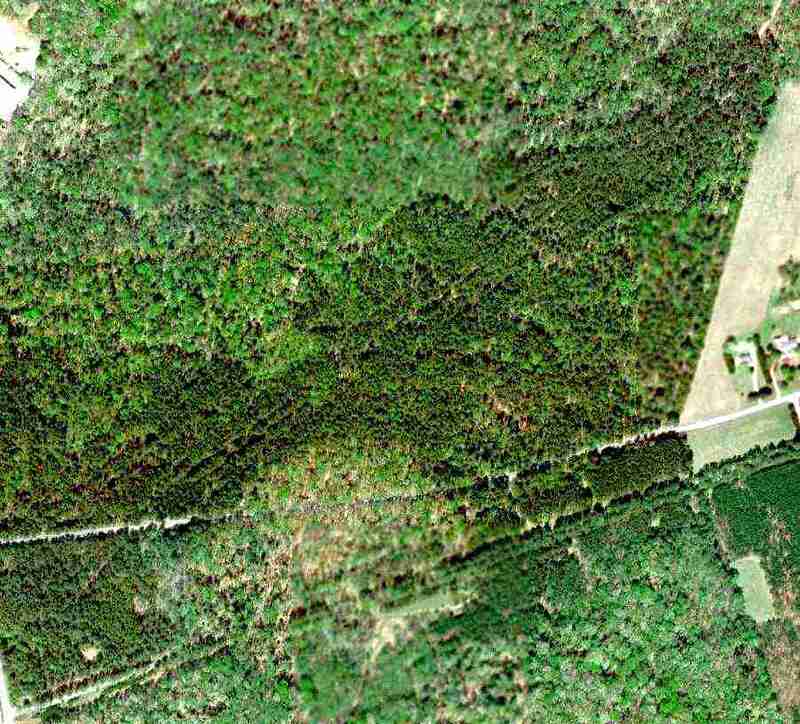 showed the outline of the 2 former runways still barely perceptible among the trees which had overgrown the site. An August 1993 aerial photo by Ray Tyson looking west at the Central Airport brick hangar/office which remained standing in the woods at the southwest corner of the site. one running northeast/southwest, the other east/west. The brick hangar/office still appeared to remain standing, in the woods at the southwest corner of the site. According to the 2003 book "Virginia Airports", the airport site became a sand & gravel pit. with an empty grass clearing in the woods in its place. 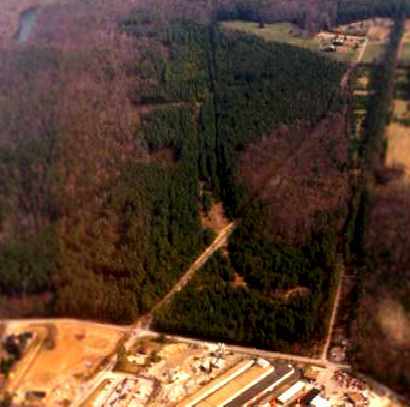 In a 4/7/10 aerial view of the site of College Airport, the outline of the 2 runways was still barely recognizable, running through the woods. The site of College Airport, annotated by Michael McGurk over a 2014 aerial photo. also known appropriately enough as Airport Road. Thanks to Jeff Mitchell for pointing out this field. The Lively Intermediate Field, as depicted on the July 1941 Norfolk Sectional Chart (courtesy of Chris Kennedy). Lively was established by the 1936 Airport & Airways Act. It was also known as Site 6, NW-WA, along the Norfolk - Washington air route. Lively was not yet listed among active airfields in The Airport Directory Company's 1937 Airports Directory (courtesy of Bob Rambo). showed the field to consist of 2 perpendicular grass runways. in the book "Virginia Airports" by Vera Rollo & Norman Crabill (published by the VAHS). described Lively as having a 3,800' runway. 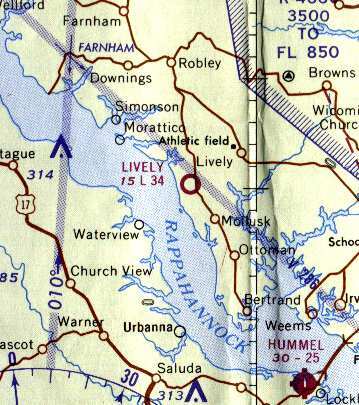 Lively was later used as one of several satellite airfields for Norfolk Naval Air Station during WW2. Lively was depicted on the 1945 Norfolk Sectional Chart (courtesy of John Voss). 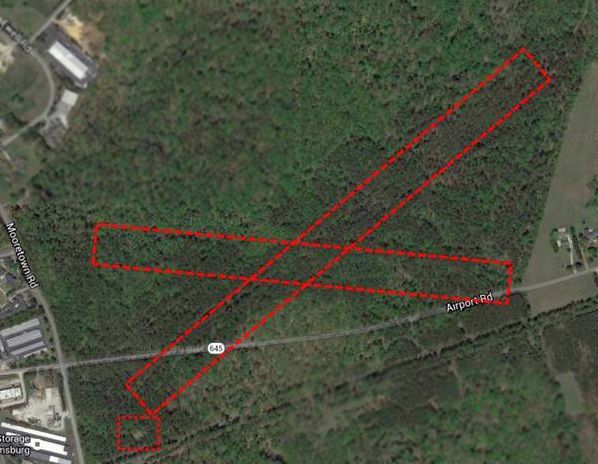 as a 52 acre cross-shaped property within which were 2 sod runways, measuring 3,400' east/west & 2,600' north/south. and a small building & a beacon to the northwest of the runway intersection. Merton Meade said, “I recall flying into Lively with a Champ. I went down there to look at a Rearwin Ranger I was interested in. with the operator listed as: Northern Neck Squadron - Civil Air Patrol. Lively Airport, as depicted on the 1965 Norfolk Sectional Chart (courtesy of John Voss). the 30-year lease for Lively Airport ended in 1966. However, multiple sources indicate that the airfield continued in operation for several more years. as having 2 turf runways: 3,400' Runway 9/27 & 2,800' Runway 17/35. A 1967 aerial photo depicted a total of 6 T-hangars (& possibly 1 aircraft) to the northwest & southwest of the runway intersection. and the operator was listed as the Lively Flying Club. 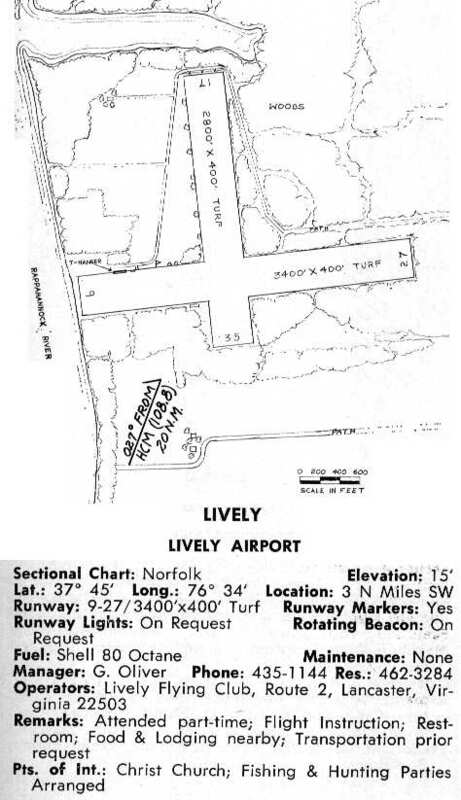 Lively was still listed as an active airport in the 1971 Flight Guide (according to Chris Kennedy). as it was not depicted at all on the 1972 Washington Sectional Chart (courtesy of Mike Keefe). with 2 small buildings to the northwest of the runway intersection. An aerial view looking east at the Lively runways, taken 3/01 by Paul Freeman from a Piper Warrior. The 2 grass runways were still very evident, as they were being farmed. and a small road grid & one small building on the west side of the field. A view of the former Runway 17 by Russ Roslewski, 2003.
as you take an "Old Airport Road" to get to it. 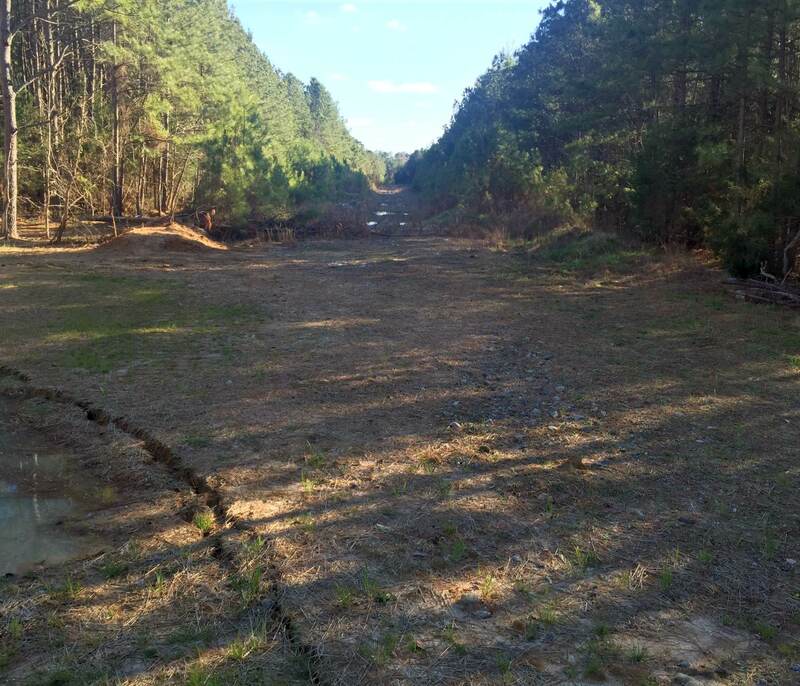 The owner has undertaken what appears to be a major tree-removal project around the east side of former Runway 9/27. The field is in very good condition, and could easily be landed on in an emergency. The land is being farmed, but I have no idea what for - it's just very short grass. 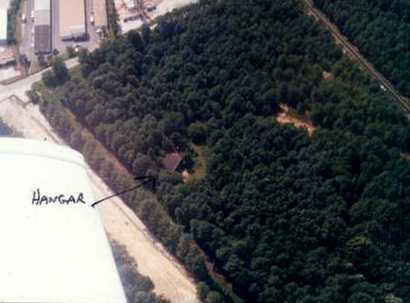 A hunting club apparently uses the wooded area around the runway, as there are signs restricting entry." A 2015 aerial view looking north shows the Lively runways remain intact & very recognizable. 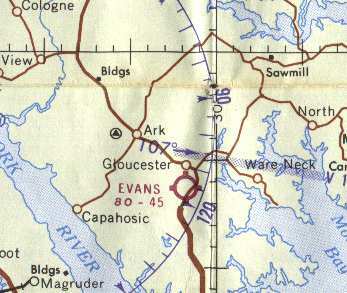 "Evans" Airport, as depicted on the 1952 Chesapeake Bay USAF World Aeronautical Chart (courtesy of Russ Roslewski). 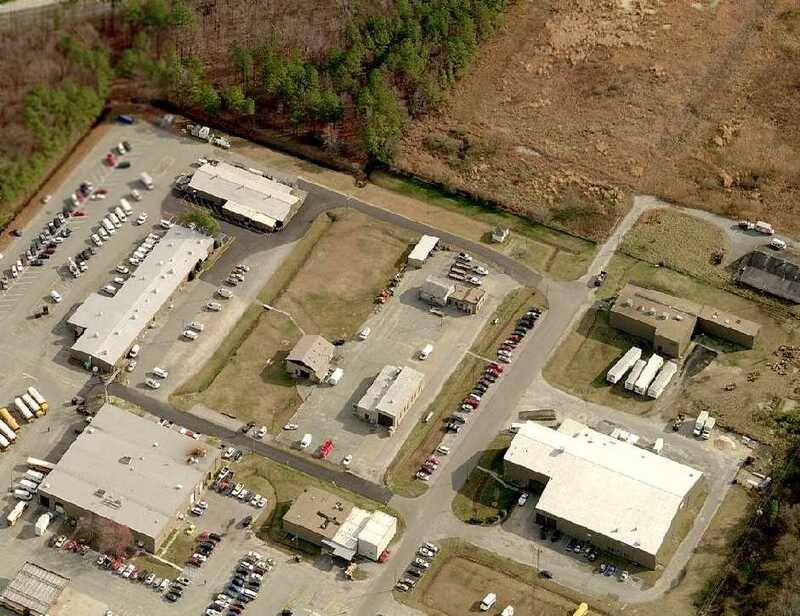 who operated the Evans Clearing Corporation at a plant at the south end of the airport. At some point the airport was purchased by Fred Ames, a local lawyer but not a pilot. which depicted "Evans" Airport as having a 4,500' unpaved runway. with several small buildings along the southeast side of the field. depicted Evans as having a 4,500' unpaved runway. 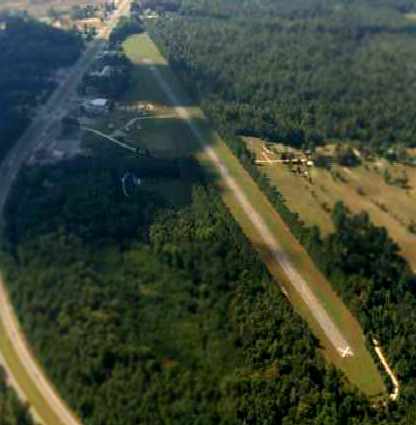 The 1962 AOPA Airport Directory described "Evans" Airport as having a single 4,500' sod runway. 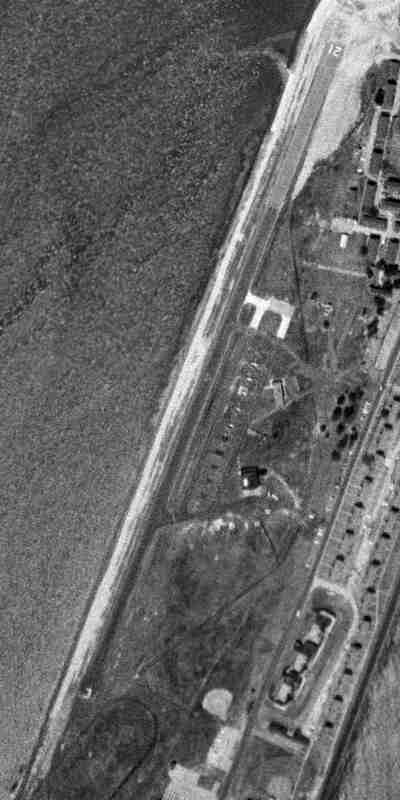 The earliest photo which has been located of Evans Airport was a 4/3/63 aerial view. 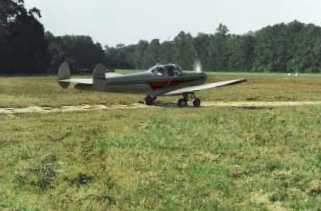 It depicted Evans as having a single northeast/southwest grass runway. A several light single-engine aircraft were parked on the southeast side of the runway. "Evans" Airport was described in much the same fashion on the 1965 Norfolk Sectional Chart (courtesy of John Voss). in 1965 the airport was purchased by Art Lazero, Horace Gray, Earl Robbins, Clyde Royals, Bill Brown, and Frances Mellar. and hired W.J. Colby as manager. Frances Mellar later purchased the entire company. 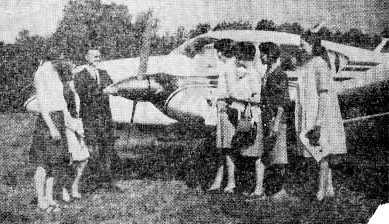 is shown explaining flight details to a group of Gloucester High School students prior to their first flight from the Gloucester Airport. in cooperation with special program offered by the state two years ago to interested persons who have never flown to become interested in that field. 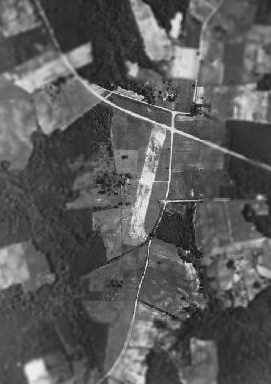 Gloucester's runway was paved at some point between 1965-67 with the help of the Virginia Department of Aviation. Fuel pumps, runway lights, and a rotating beacon (a slightly remodeled airway beacon) were also added. A 1967 aerial view by Bruce Grow looking east at the Gloucester Airport ramp. In 1967 the field was home to 15 aircraft, and conducted 5,500 takeoffs & landings (according to Scott Denny, Virginia Department of Aviation). 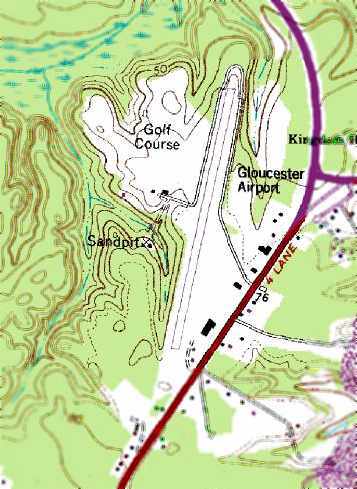 described Gloucester Airport as having a single 3,500' paved Runway 2/20. and the manager was listed as W.J. Colby. A circa 1960s photo by Willy Hayes of Bill Corbett departing Runway 2 at Gloucester. An undated photo by David Grow of Mike Tomlinson’s Ercoupe taxiing out at Gloucester. 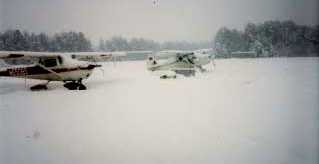 An undated photo by David Grow of a Cessna 152 & a Piper at a snowy Gloucester Airport. listed the operator & manager of Gloucester Airport as F. J. Mellar, Sr.
a Citabria dealership which offered aircraft sales, primary & aerobatic instruction, aircraft rental, maintenance, and fuel. Ron Jones recalled, “I did some training at the old Gloucester Airport in 1973-74 while stationed at the USCG Reserve Training Center in Yorktown. 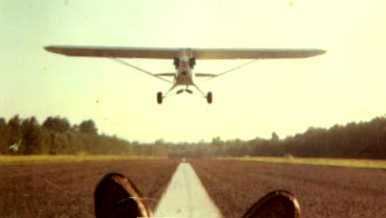 I did my 1st solo there in a Citabria 7ECA on my 2nd flight in a taildragger with only 1 hour of taildragger time. It was a great place to spend the weekend & there was a lot of activities all the time. and there was a Taylorcraft BD12D with no side windows that everyone seemed to fly. I didn't even know who owned it but I often helped work on it. After my solo I flew about 10 hours out of there & remember that a water tower was built right off the end of Runway 20. On final you could wave at the construction workers on top of it & they would wave back. Also the row of trees halfway down the runway would cause the wind to do strange things while landing on Runway 2. They gave aerobatic instruction & one afternoon a guy was flying his Mooney in to take instruction. in fact he almost lost it & went around but kept going & didn't come back. 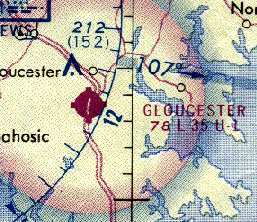 Gloucester Airport, as depicted on the 1975 Washington Sectional Chart (courtesy of Ed Drury). 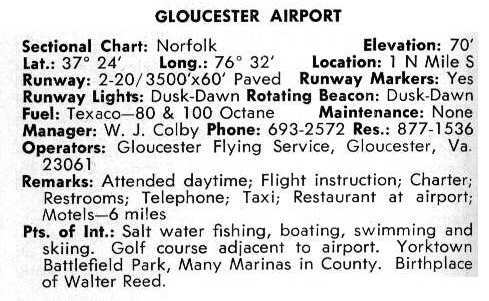 in 1975 Gloucester Airport was home to 14 aircraft, and conducted 7,000 takeoffs & landings. and Jack Brandt ran the airport. Brandt conducted flight instruction, and also operated a Queen Air out of Gloucester on charter. as having a 3,500' paved runway. and I.L. Aviation, run by Irv Linchner. 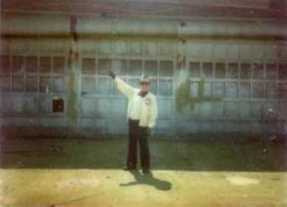 Irv was Gloucester's last Fixed Base Operator. but still keep the airport in operation. due to a lack of support from the County, the Department of Aviation, and local interests. 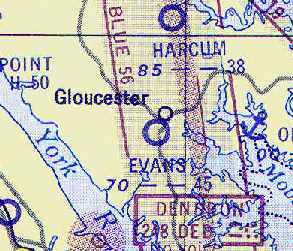 It was still named Gloucester Airport on a 1986 Approach Plate (courtesy of John Clifford). was a 2/27/87 photo by Kenneth Keeton of his 172C at a snowy Gloucester, with a building & several other aircraft in the background. 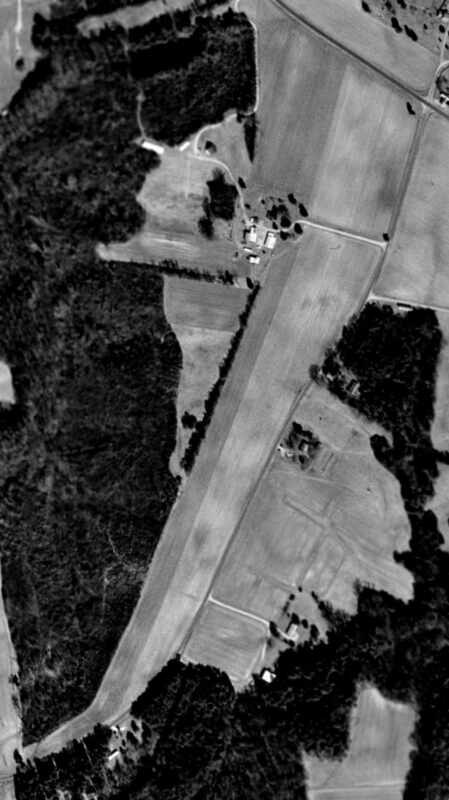 as a 1988 aerial view looking south at the field clearly showed a closed-runway “X” symbol on the northern end of the runway. and reopened as Francis J. Mellar Field. It was labeled Mellar Field on the 1991 Washington Sectional Chart (courtesy of Mike Keefe). but at least one source listed it as an operating airport several years later. I was frequently driving [by] & always passed by Mellar Feild. I remember always noting that single aircraft there & wondering if they would ever fly it. It never moved. One day I stopped & noted the tail number. While I was there I did a quick walk around & checked it out. When I sumped the tanks (it was green 100/130, not blue 100LL), some crud & water came out & the tires were low/flat. During the walk around I was able to see the registered owner on the registration. I looked up the owner & asked if they would be willing to sell it. Their response was that they were waiting for parts but they wanted to keep it. From the condition that it was in, I doubt it ever flew again. It was a straight tail Cessna 172.
labeled the single paved runway as “Mellar (closed)”. 1994 is the last year that a license was issued." yet one single-engine light plane was still on the field, in the tiedown area on the southeast side of the field. by a 1995 Gloucester County study, but was found to be too limited for expansion. The Mellar Field property was sold after the completion of the study. 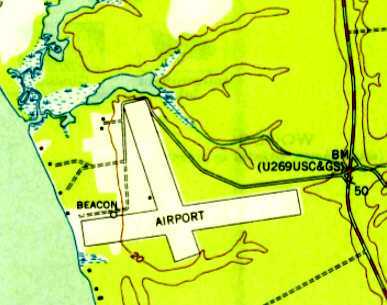 Mellar Airport was still depicted as an active airfield in a 1996 airport directory. The airfield consisted of a single paved 3,529' Runway 2/20. as it was labeled "Mellar Field (Closed) on the 1998 Washington Sectional Chart (courtesy of Mike Keefe). A March 2001 aerial view looking south at the remains of the Mellar runway, taken by Paul Freeman from a Piper Warrior. 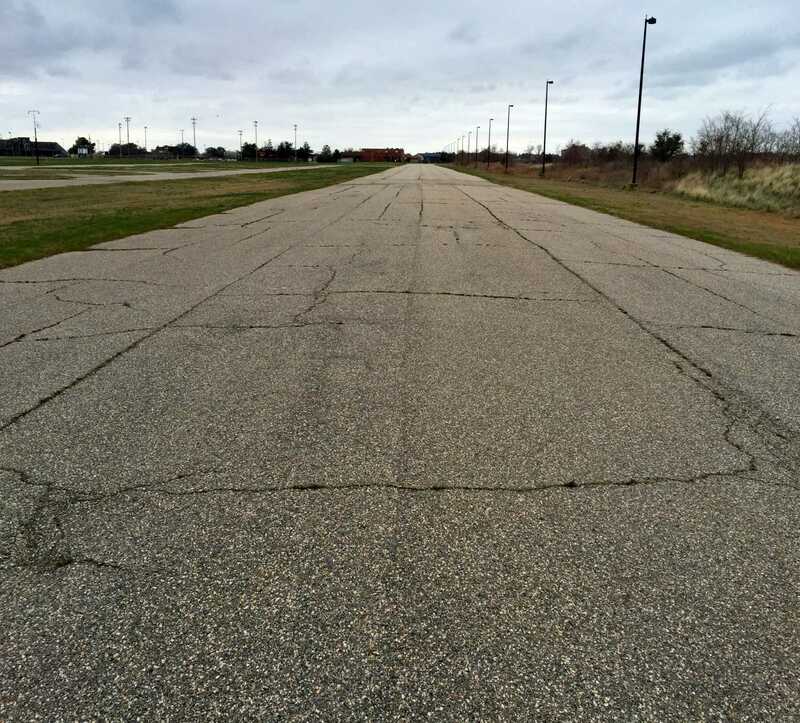 The runway pavement was badly deteriorated (or had been broken up), and a driveway crossed the middle of the runway. A 2003 view looking north along the former Runway 2 by Russ Roslewski. Russ reported, "In the distance you can see the roof of the new Wal-Mart building. They must have demolished part of the north end of the runway to make room for the store. Just like I always say, we can certainly use more Wal-Marts & less airports. Mellar field is all but obliterated. In fact, I flew overhead a few days ago & couldn't find it. The north half is still paved, but the asphalt is in extremely deteriorated condition. The south half is basically all mud. that is undergoing construction next to the Super Wal-Mart that is already position just off the north end of the runway. There is a large mound of dirt near the south end which leads me to believe this theory. if I didn't know it used to be a runway, I could have driven across it and not even noticed." (presumably other than the remains of the runway). but the majority of the former runway was still recognizable to the south. And amazingly the airport office building appeared to remain intact (a small gray building at bottom-center). 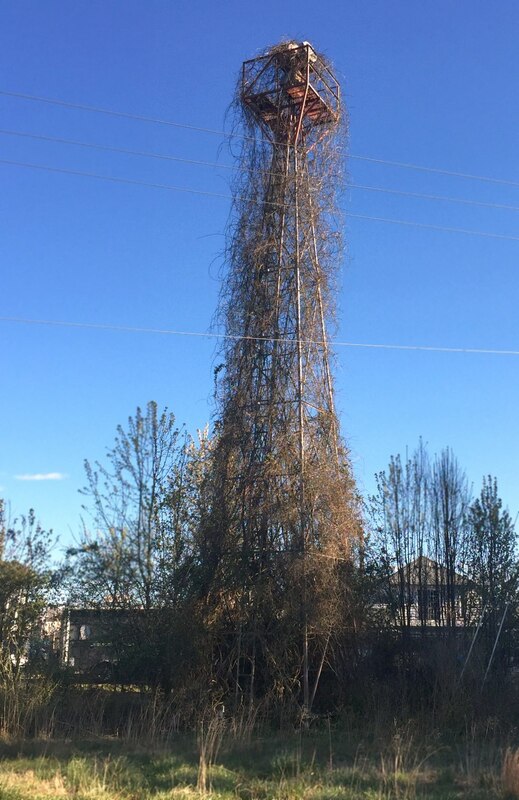 A 3/15/17 photo by Paul Freeman of the amazing sight of the Mellar Field rotating beacon, completely intact atop its tower, but also completely enshrouded in vines. A 3/15/17 photo by Paul Freeman of former Mellar Field airport office building, with the rotating beacon tower in the background. A 3/15/17 photo by Paul Freeman looking southwest along the former Mellar Field runway, taken from where Golf Club Road crosses the former runway midpoint. Trees have grown right up to the edge of the former runway pavement, but apparently have been prevented by the pavement remains from growing on the runway itself. 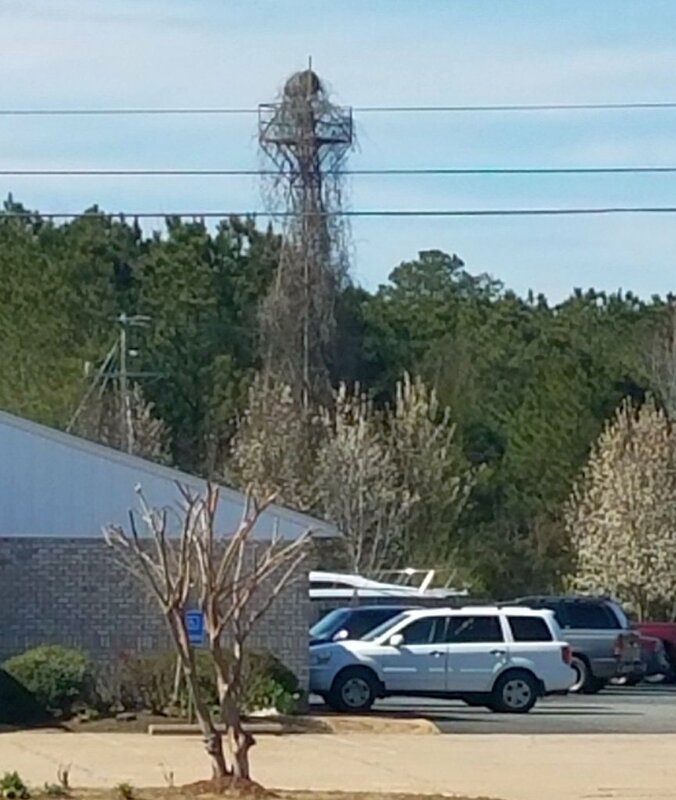 A 3/22/18 photo by Dave Whittaker of the Mellar Field rotating beacon, completely intact atop its tower, but also completely enshrouded in vines. Walker AAF, as depicted on the July 1954 Norfolk Sectional Chart (courtesy of Chris Kennedy). 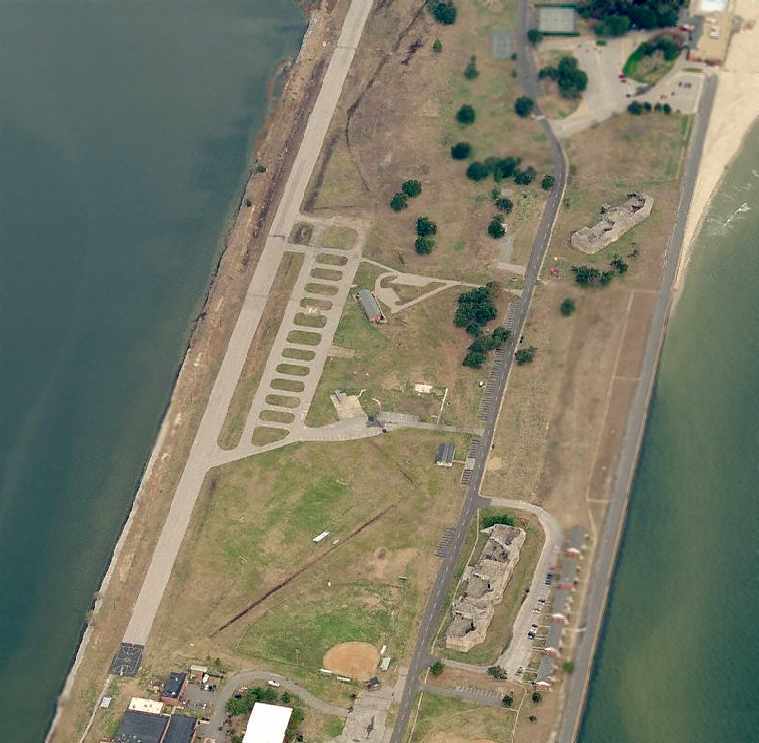 This Army Airfield is located on the grounds of Fort Monroe, which itself dates from 1818. 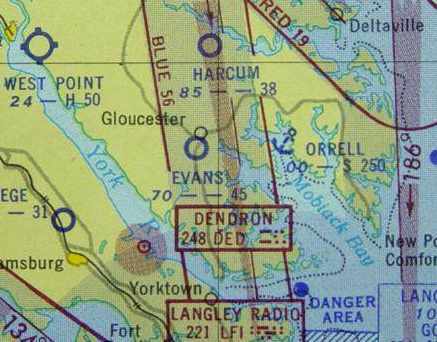 The airfield is situated along the west side of a narrow peninsula along the Chesapeake Bay. Walker AAF was dedicated in 1951 in honor of Lt. Col. John Walker, who was killed in Italy in WW2. 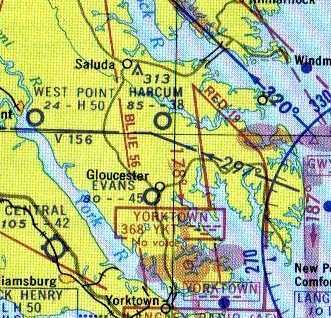 on the July 1953 Chesapeake Bay USAF World Aeronautical Chart (courtesy of Chris Kennedy). was on the July 1954 Norfolk Sectional Chart (courtesy of Chris Kennedy). It depicted the field as having a 2,000' hard surface runway. with a small ramp on the east side having a single building (a hangar?). on the 1961 Norfolk Sectional Chart (according to Chris Kennedy). The earliest photo which has been located of Walker AAF was a 3/30/63 USGS aerial photo. It showed several parking spots next to a small building on the east side of the runway. 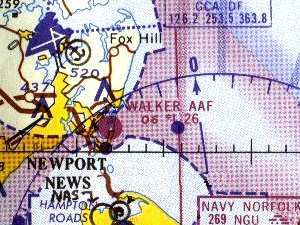 Walker AAF was still depicted as an active airfield on the 1964 Norfolk Sectional Chart (according to Chris Kennedy). After 1964 the facility was used purely for helicopter operations. but the Aerodromes table on the listed the status of the field as "Closed". It was described as consisting of a single 2,600' asphalt runway. 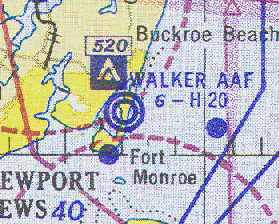 The September 1967 Norfolk Sectional Chart depicted Walker AAF as an abandoned airfield. 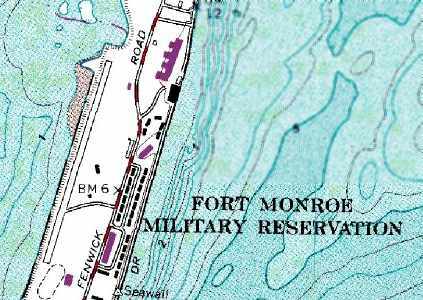 The 1986 USGS topo map still depicted the Walker runway, but did not label it. but the only use of the airfield is for helicopter operations, as Walker Army Heliport. the Sports Car Club of America & the Tidewater Sports Car Club as a race track. and a helipad marked on the very southern end of the runway. as part of the Base Closure And Realignment process. According to the article, “The airfield is too short for today's aircraft & the Army primarily used it for helicopters. A 4/6/10 aerial view looking northwest showed the Walker runway remained in decent condition. A 3/14/17 photo by Paul Freeman looking southwest along the abandoned Walker AAF runway. 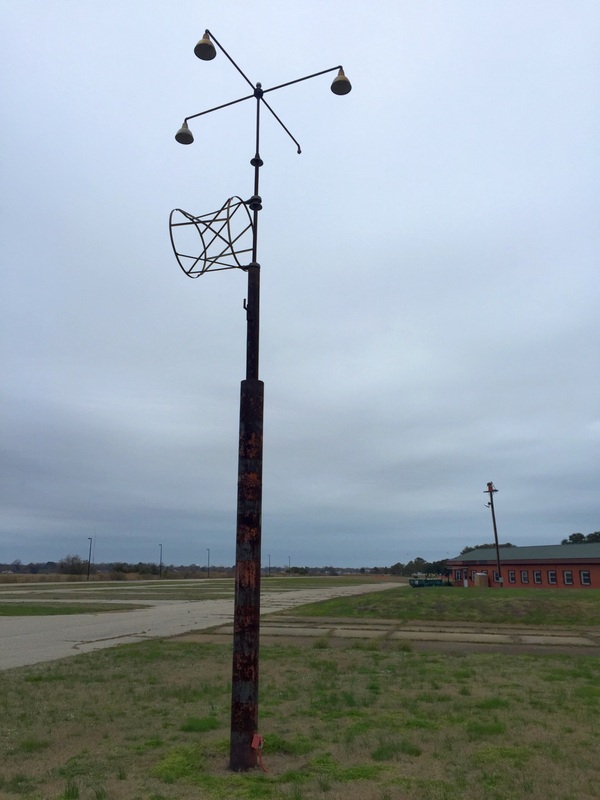 A row of light poles has been installed along the western edge of the runway, which otherwise remains intact. A 3/14/17 photo by Paul Freeman looking west at a former Walker helipad on the east side of the runway, with the “H” marking still recognizable. with the runway & operations building in the background. A 3/14/17 photo by Paul Freeman looking southwest at the former Walker AAF operations building.